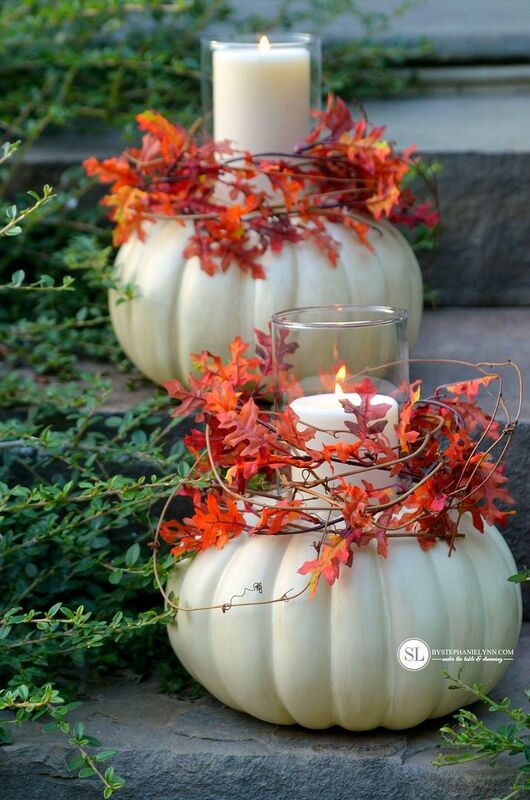 Craft Pumpkin Candle Holders – #michaelsmakers | September is finally here and we are highly anticipating the arrival of fall. 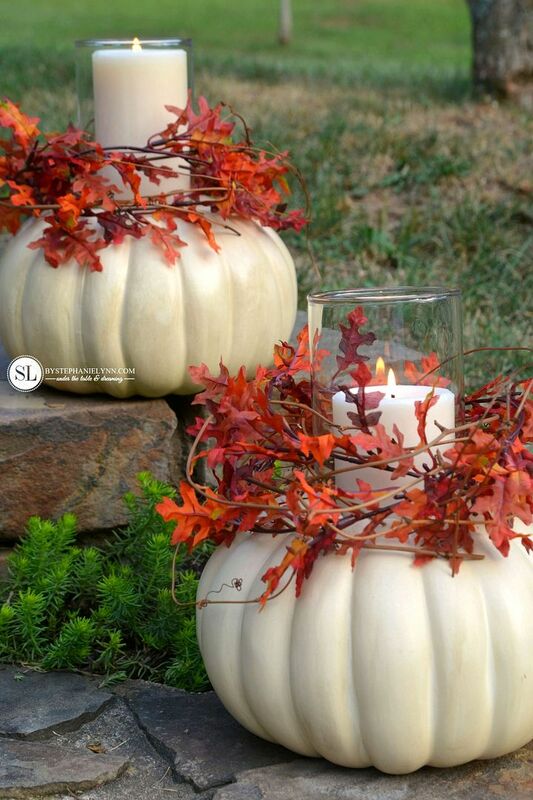 We have a few festivities lined up the next couple of months so I’m anxious to get a jump start on our fall decor. It will be a few more weeks before the pumpkins are ready to be harvested at our local roadside stand, so I made a trip to Michaels Pumpkin Patch for some early picking. 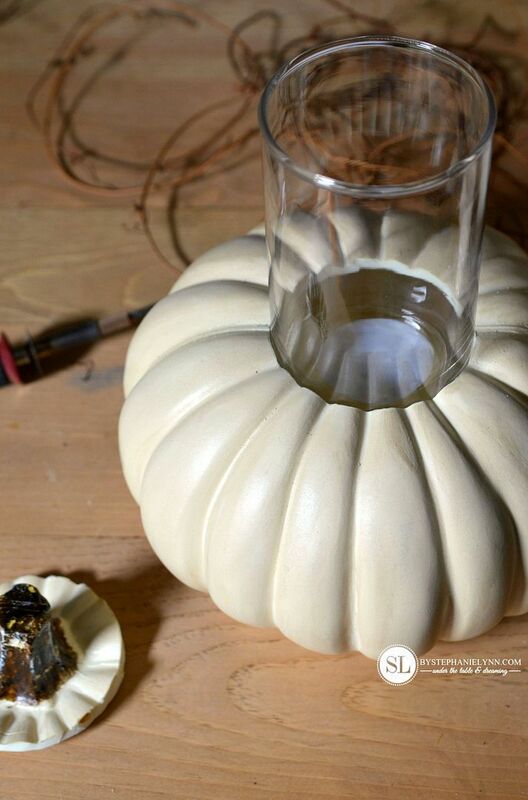 This year I decided to turn our pumpkins into some Craft Pumpkin Candle Holders as part of the Michaels Makers September Challenge. 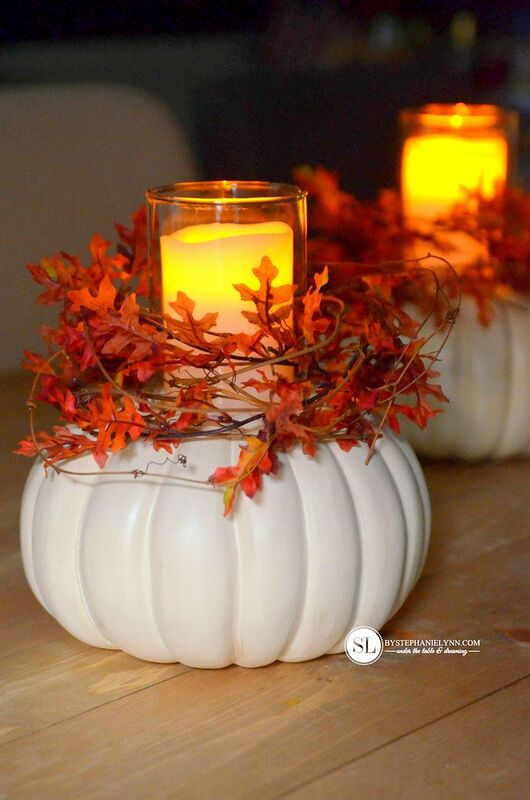 These craft pumpkin candle holders do not require any special crafting skills, are incredibly easy to put together and require just a few supplies . 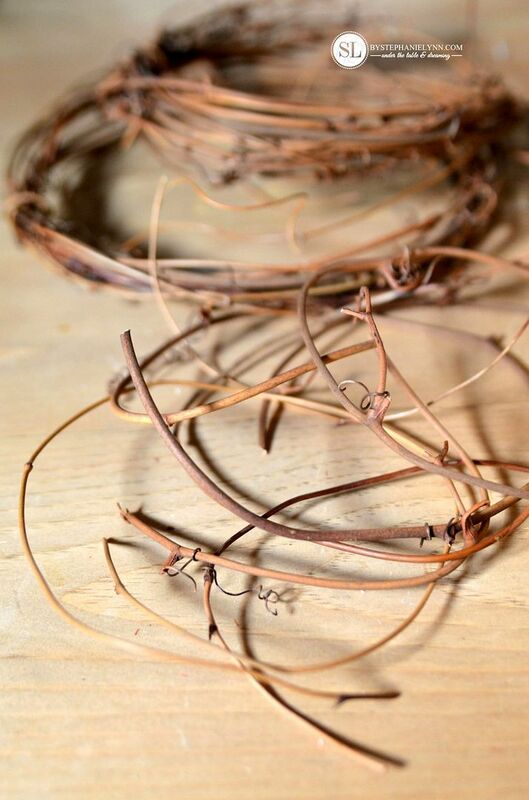 They can be used outdoors, as table centerpieces or simply as fall decor throughout your home. 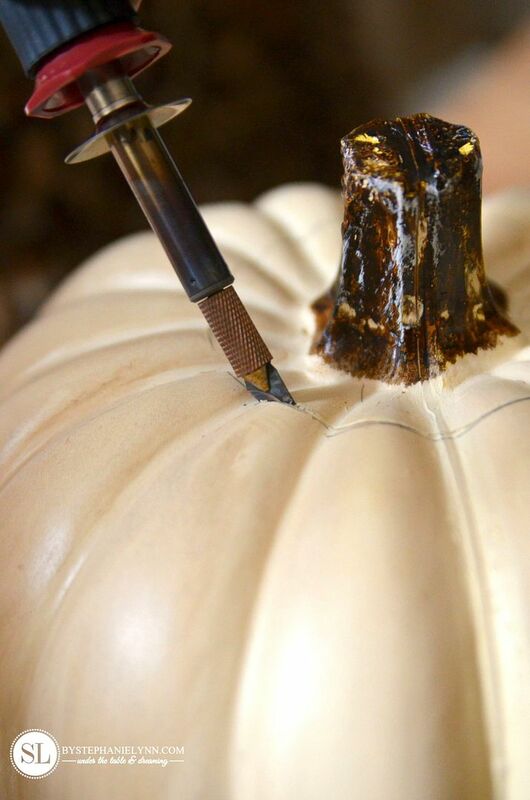 Step One: Trace the outside of the candle holder with a pencil, on top of the craft pumpkin, to create the cutting guidelines. 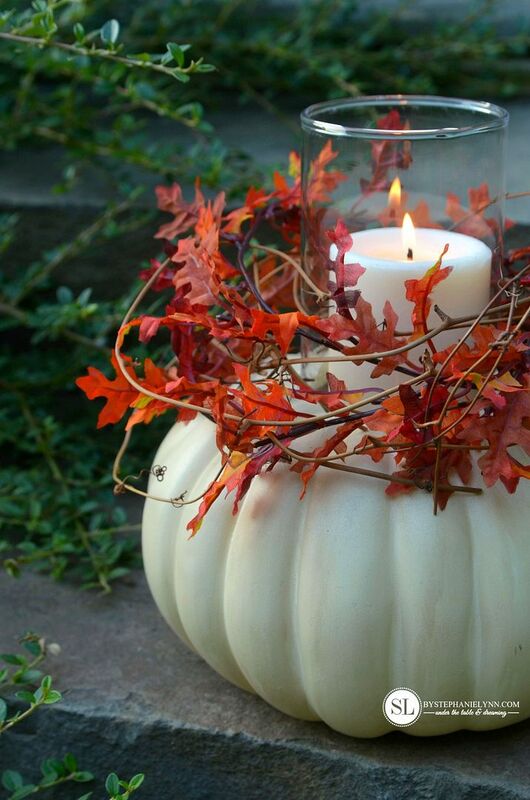 Michaels has a large selection of craft pumpkins, in a variety of shapes, sizes, and colors. They even have two new additions this year – including the cream cinderella shaped pumpkins, used for this project, and these fun and unique half pumpkins! 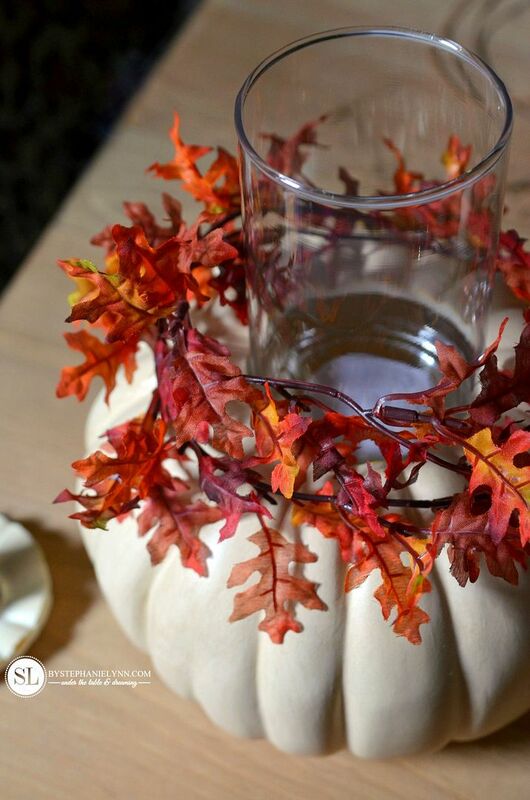 To create the cutting guidelines, turn the glass candle holder upside down and place it on top of the pumpkin. Center the candle holder as much as possible and trace around the rim with a pencil. 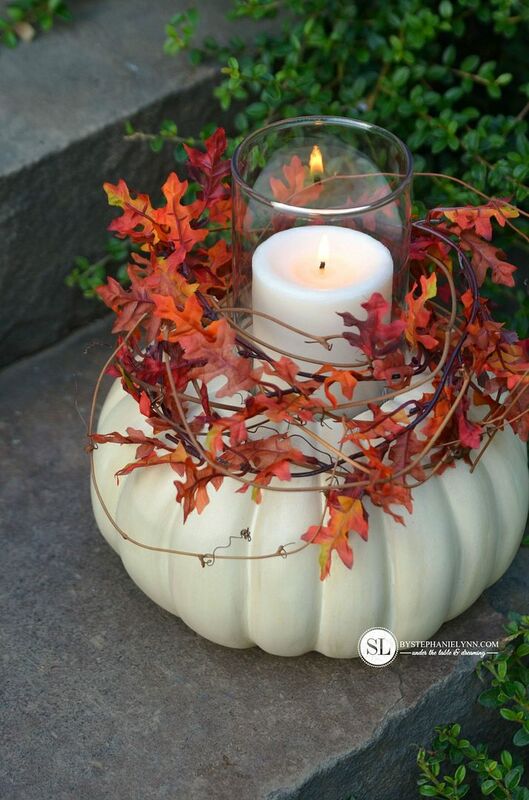 You will want the candle holder to fit snug in the pumpkin so make sure the trace lines are close to the candle holder. Step Two: Cut the top of the craft pumpkin. I love using the Creative Versa-Tool to cut the craft pumpkins. I used it last year to make the precise cuts for the Craft Pumpkin Candy Holders. This tool is mainly used for woodburning and can be found in the unfinished wood section. You just plug the tool in, let it heat up, then carve. 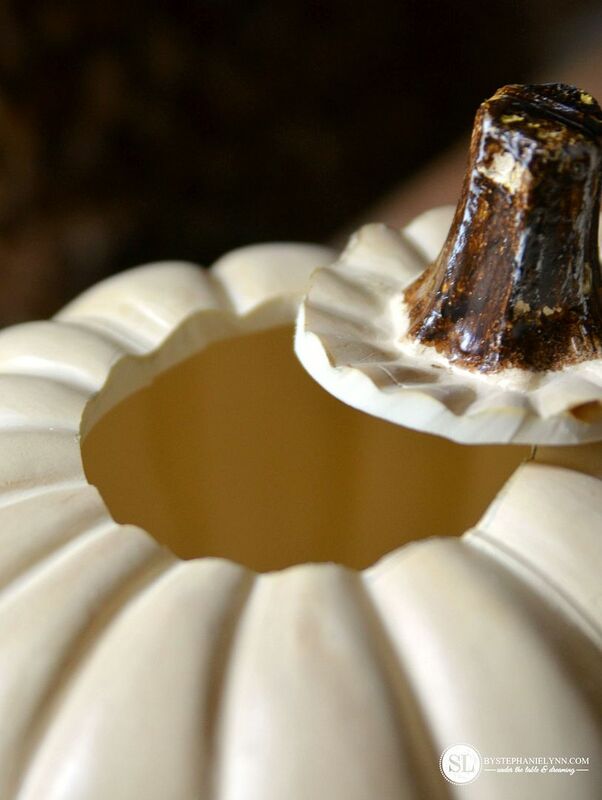 It makes cutting the pumpkins a piece of cake and the cuts are nice, clean and smooth – without any mess. When cutting the pumpkins, cut as close to the pencil guidelines as possible and try not to go outside them. You want the glass candle holders to fit snug. The foam material has a some give so if the cut is made a little smaller then the guidelines – you will still be able to maneuver the candle holder in place. Any pencil lines that still show after the cuts have been made can easily be erased with a pencil eraser. Step Three: Tuck in the glass candle holder. The glass candle holders come in a couple different sizes. The 6 inch Glass Cylinders were used for this project. 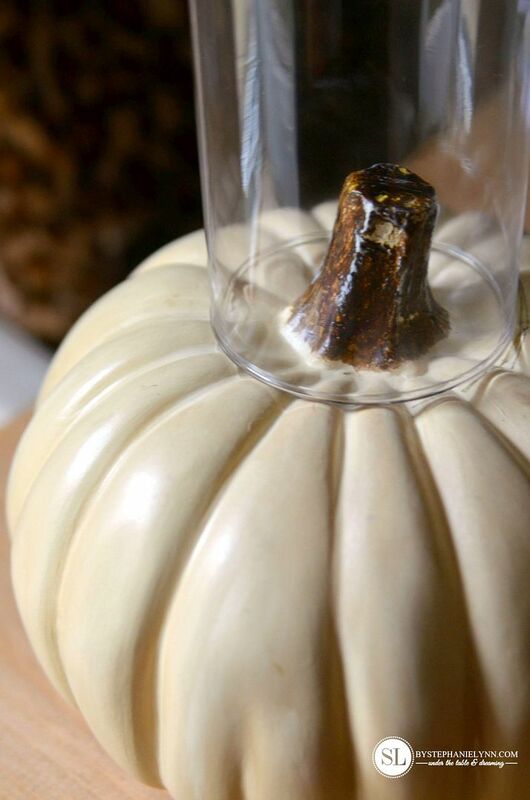 If the cuts were made too big and the glass cylinder does not fit snugly into the pumpkin, a piece of foam can be used inside the pumpkin to prop up the cylinder to the correct height. Step Four: Embellish the Pumpkin. 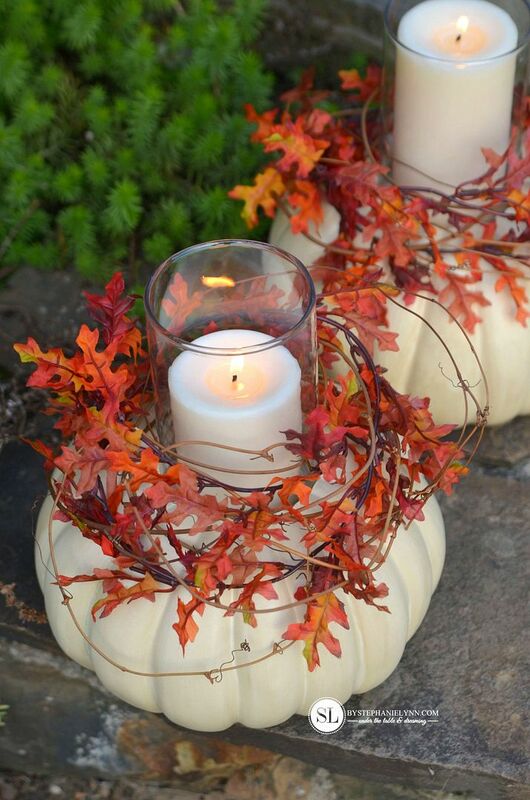 There are many ways to embellish the craft pumpkin candle holders to coordinate with your fall decor. Candle rings, faux florals, and garlands can all be used. 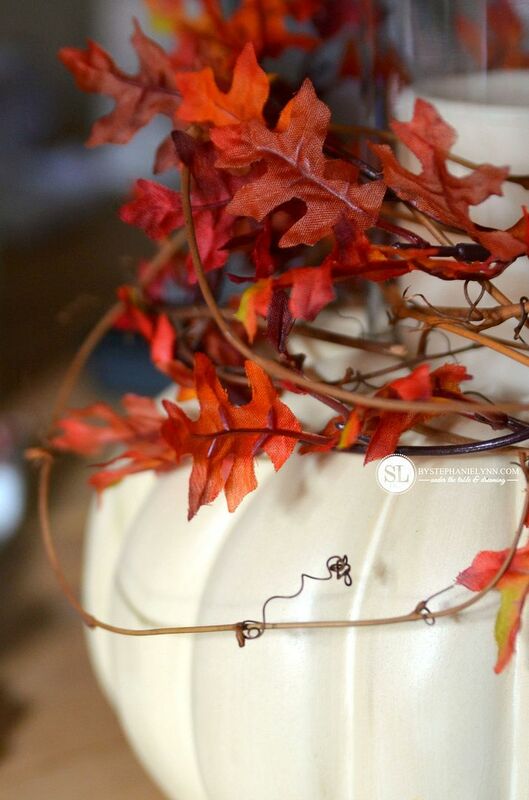 I began with a simple faux fall leaf garland found in the seasonal section. The garland is wired and holds its shape fairly well when wrapped around the glass candle holder. A dab of hot glue can be used to hold it in place – though I didn’t seem to need any. 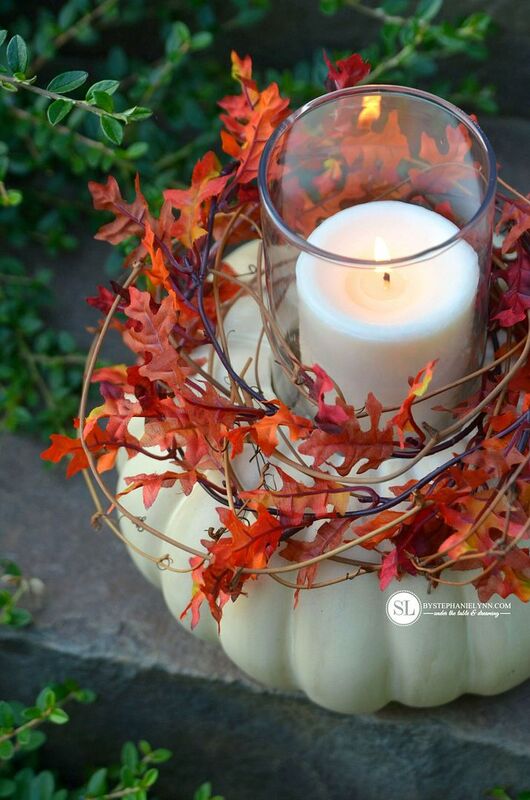 One garland was long enough to make the two craft pumpkin candle holders in this tutorial. I simply cut it in half. A few sprigs of Grapevine Garland was added to each pumpkin as well. I simply cut a piece from the roll and separated the individual pieces of grapevine. The pieces were then wrapped around the glass candle holder and randomly intertwined with the leaf garland. Step Five: Add the candles. I used a combination of a 3 inch and a 5 inch regular pillar candle, shown in the photos below. Flameless candles can also be used if you are leery of an open flame. These 3″ X 4″ LED Candles are shown at the bottom of the post. This post is brought to you by Michaels . The opinions read here are entirely my own. To kick off fall in your own home, visit Michaels for a variety of craft pumpkins in every color, shape and size you could ever want! 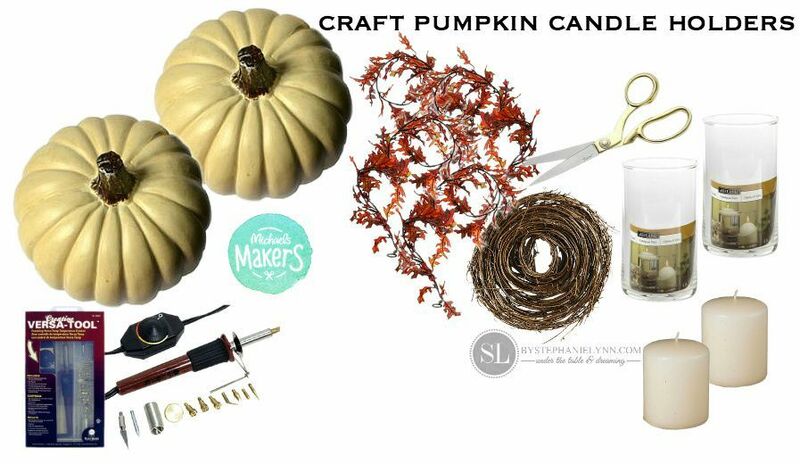 There are tons of ways to DIY your own craft pumpkin for your home, a party or even as a gift. 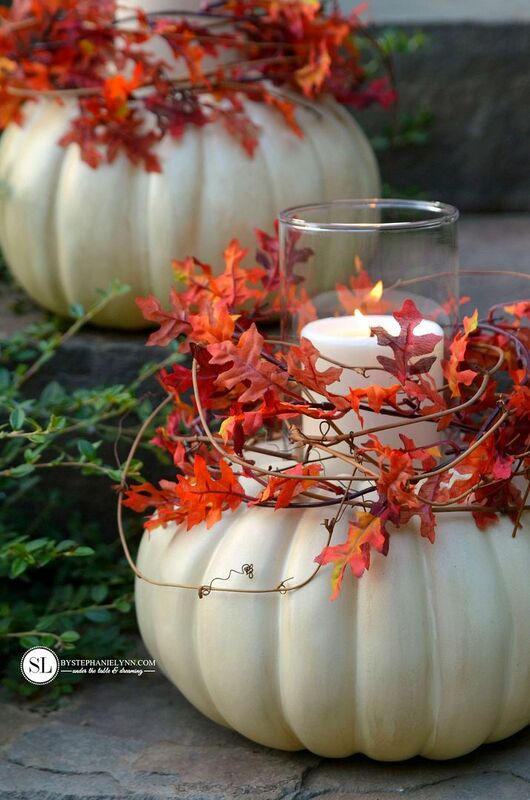 If you’re looking for something a little bit different, Michaels recently started selling these fun half pumpkins, perfect for fall décor wall mounts and fun signs. And if you’re in need of more fall décor inspiration be sure to check out the 49 other DIY pumpkin projects from the rest of the Michaels Makers above – Happy Crafting! These are gorgeous! I’m sharing with my mom so she can make them for Thanksgiving! My son and I are going to make a few of these for the nursing home to brighten their tables. We will be using flame less candles. These are so pretty! Love the way you layered everything. How did you keep the blade in the handle? Mine keeps coming out everytime I move it. I’m doing at least 8 of these for a wedding rehearsal and think yours are beautiful. Thanks Mechelle. The blade should screw into the tool. If it does not stay attached it may be defective. If it is new, I would try to return it or contact the manufacturer for a warranty replacement. If you are in a bind you could also use a heavy duty utility knife.